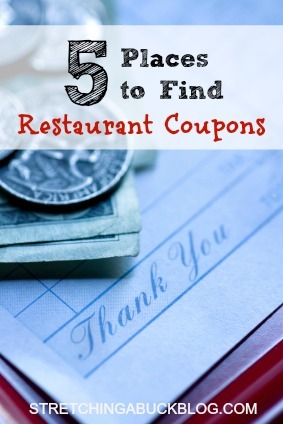 Yesterday I received an email asking me how to find restaurant coupons, so I thought it would be a good opportunity to write a quick post with my best tips. 1) “Like” your favorite restaurants on Facebook. Many restaurants offer one day specials, freebies and “kids eat free” days that they notify their followers of on Facebook. I have scored many great deals on dining out by catching posts in my news feed. I find this to be especially useful for local/non-chain restaurants in my city. 2) Go to your favorite restaurant’s website and look for information on their loyal customer program/club. Some of my favorites that I currently use are Starbucks, Bob Evans and Papa John’s. Some programs are genuine loyalty programs where you earn freebies after so many purchases, and others simply mail or email you coupons on a regular basis. 3) Purchase an Entertainment Book. These books are stuffed full of great coupons tailored toward your local area. If you are a frequent diner these can pay for themselves with as little as 1-2 coupons, plus shipping is FREE. 4) Check out my Restaurant Deals page where we occasionally post some of the best restaurant coupons that we find. Sometimes company’s email us advance notice of deals, and other times we find them on Facebook just like you would. Either way, check out this page from time to time to see if you find anything new to you! 5) Daily deals sites such as Groupon and LivingSocial are always offering great deals on local restaurants. Often new restaurants get the word out by offering huge discounts to get new customers in the door, but you can sometimes score vouchers to well established restaurants as well. I have personally purchased restaurant coupons from both of these sites in the past and have not been disappointed! Do you frequently use coupons when dining out? Where do you find the best deals?